Nazim Burke, Political Leader of the main opposition National Democratic Congress (NDC) has warned the voting population that the promises in the party’s manifesto may not be achieved in the manner and time as outlined in the document. 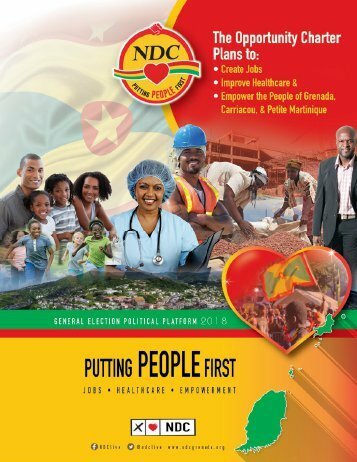 The party launched the digital version of its manifesto for the 13 March General election during a news conference on Thursday and has given the assurance a book version with summary points will be launched on Sunday during the youth rally that will be held in the parish of St Andrew. “We cannot sit here today and tell you that everything we say will be done in the manner in which we say it will be done and in the time we say we will get it done, but we are telling you these are our commitments and that is what we are going to be striving for,” Burke said before concluding his presentation on the manifesto in which 3 priority issues are: jobs creation, improving healthcare and empowerment of the people. Regularising of all public officers who are in the system for more than two years. “The plans and programmes here are realistic, they are achievable. If we work hard and we are able to gain and retain the confidence and trust of the people, that will inspire them to realise the full potential of our nation,” Burke said. Burke said that the summary version of the manifesto that will be launched on Sunday during the party’s youth-led rally will capture the key elements of the 26-page document. “The book will have what we want you to remember,” he said. Chairman of the Party Vincent Roberts told journalists that the NDC developed the manifesto with contribution from the people, after the party had put out an online call for proposals. “Of the 15 points in our action plan that we spoke of online, I think 8 of them came from comments made by the public online,” said Roberts who is confident that the NDC will regain the power to govern the country for the next 5 years.